Whatever you do, don’t shrug your shoulders and decide the task is too hard, too much or too much to ask. Have the courage to live by faith until you are able to live by sight, and make that choice right now. The most painful regrets are the things left undone, the hopes and dreams left idle and the opportunities never pursued. Choose to seek the abundant possibilities in each moment. Invest in the hope for a beautiful tomorrow. Chase your dreams with vibrant faith. You’ll never look back wistfully and wish that you had spent more time in anger, resentment or worry. Let those emotions go. Focusing only on the outcome you desire is not wise. Instead, take small, deliberate steps each day to move yourself closer to your goals. Live in gratitude, joy and enthusiasm. Do not let this moment pass without feeling all of the positive possibilities around you. If you hurry through life, you will miss the beauty that is everywhere. If you hide from life, you will miss moments that were meant to make you smile. 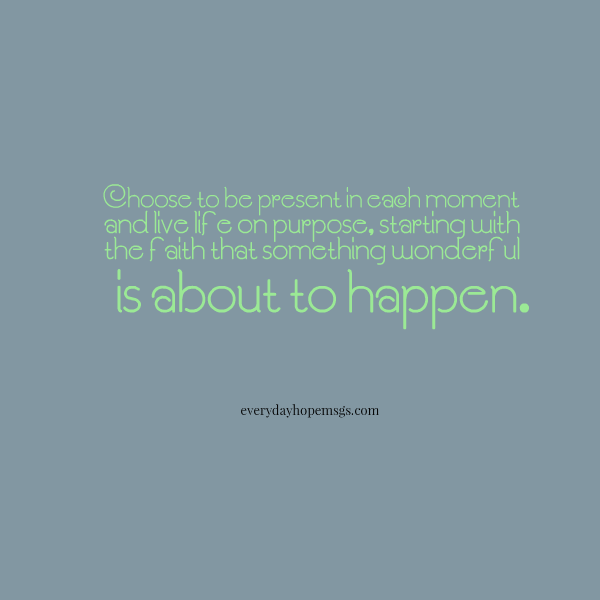 Choose to be present in each moment and live life on purpose, starting with the faith that something wonderful is about to happen. Live by faith until you can live by sight.